Who discovered oxygen? Priestley? Lavoisier? Scheele? 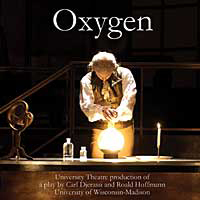 This play, written by renowned chemists Carl Djerassi of Stanford University and Nobel Laureate Roald Hoffmann of Cornell University, tells the story of a fictitious modern day Nobel panel's attempt to determine who discovered oxygen. The story is told in a series of flashbacks to the 18th century lives of Joseph Priestley, Antoine Lavoisier, and Carl Wilhelm Scheele and presents three experiments, one reflecting the work of each scientist. This is the official, professionally recorded version from a theater production at the University of Wisconsin-Madison and includes personal interviews with the authors and director. Great before a school vacation! Explore science history, the human side of scientists, competition, collaboration, and the meaning of discovery. 130 minutes. © 2019 Roald Hoffmann. All Rights Reserved.